Welcome to Raccoons' Rest in Pigeon Forge! 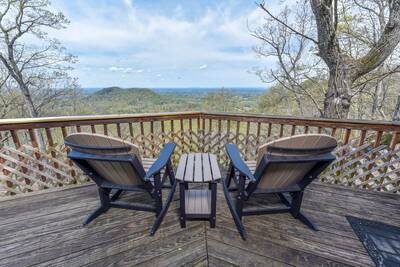 This fabulous 3 bedroom, 3.5 bath cabin rental is a remarkable place to spend your next Smoky Mountain vacation getaway! As soon as you enter this stunning cabin rental, you are greeted by the spacious open floor plan and floor to ceiling windows that frame the forest view. The cozy living room provides you with a stone accented fireplace, pool table, flat screen TV, deck access and relaxing leather sofas. There’s also a nearby half bath for added convenience. Located next to the living room is the fully equipped kitchen and dining area. 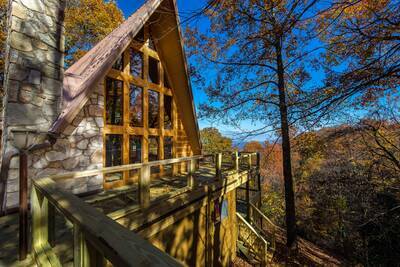 Prepare, cook and serve your favorite meals all from the comfort of your cabin rental while staying in the Smokies. On the main level of Raccoons' Rest is where you’ll find the spectacular master suite. This gorgeous bedroom provides you with a king bed, fireplace, flat screen TV, deck access and an in-room jetted tub. There’s also an adjoining private full bath. 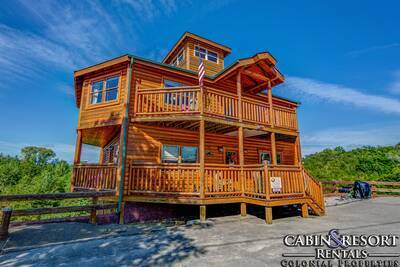 Venture upstairs at this Pigeon Forge vacation cabin and you’ll find two additional bedrooms and two full baths with walk-in showers. Both bedrooms feature custom log king beds and flat screen TVs. Outside you're treated to a wonderful covered deck with rocking chairs, a patio table, and a bubbling outdoor hot tub. 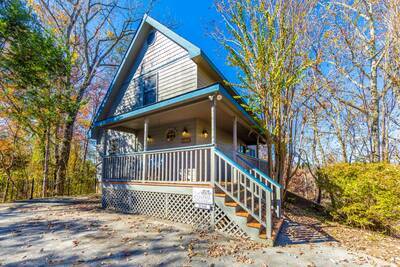 There's also a second deck just off the kitchen with a picnic table and nearby BBQ Grill. Raccoons' Rest provides you and your special guests with complimentary high speed WiFi internet access so that you can check your email or browse the internet while you’re on vacation. When staying at this beautiful Pigeon Forge cabin rental, be sure to pack along your bathing suit and pool toys so that you can enjoy the nearby year-round swimming pool. With amazing features, countless amenities and a location less than 10 minutes from downtown Pigeon Forge and 5 minutes from Dollywood, you are certain to have the time of your life at Raccoons' Rest. 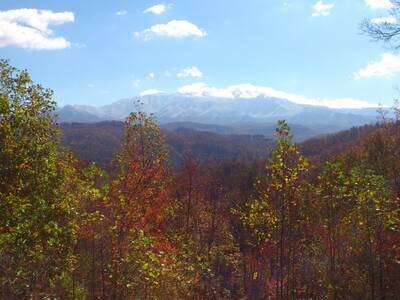 Plan your Smoky Mountain getaway here today! A: This pool is used by any guest staying in the Hidden Springs Resort. A: Hi Bobby! On the main level of Raccoons' Rest is where you’ll find the spectacular master suite. This gorgeous bedroom provides you with a king bed, fireplace, flat screen TV, deck access and an in-room jetted tub. There’s also an adjoining private full bath with shower. A: Hi Barbara! Raccoon's Rest is located inside Hidden Springs Resort. This Resort was not located near the fires of 2016. The roads are paved to the cabin and within the Resort. A: Hi Stephen! This cabin is not pet friendly, but we have others that are. “ Cabin was great. Cabin looked just like the pictures on line. Would stay here again. “ The cabin was very clean and the check-in/check-out process could not have been easier. We really enjoyed our stay and will definitely look to rent Racoon's Rest again. “ We really enjoyed our cabin. It was an awesome experience! “ As soon as we walked in we knew we were in for a good time! Loved the cabin and loved the scenery! We had to leave early due to a family emergency, but we will definitely return here for our next smokey mountain vaction!